Woongjin Coway re:nk | May our skin grow beautiful, as we grow wiser. Re : Nk is a luxury Korean brand by Woongjin Coway, a korean company which are known for their water and air purifiers. Woongjin Coway launched Re-Nk in 2010. 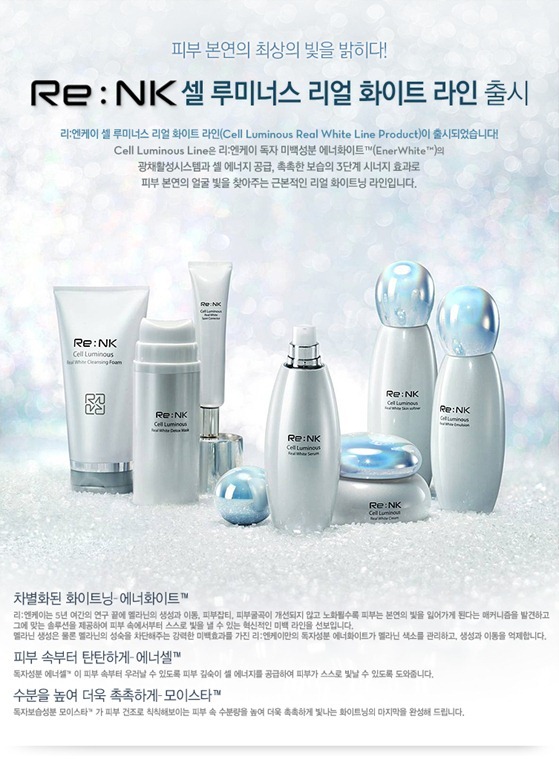 Re-Nk isn’t Coway’s first cosmetic brand – they sold off Coreana Cosmetics Co. Ltd in 1999, and re-entered the Korean cosmetics market with Re:Nk. What exactly dooes Re:Nk stands for ? It stands ‘Rebirth of New Skin’ and ‘Revolution of New Knowledge’ which gives an impression of cutting-edge biotechnology cosmetic brand. Re-Nk currently boasts 40 patented ingredients, which is substantially higher than an average of 3-4 patents for other brands in their markers. Nanotechnology is also applied to their products to ensure maximum absorption of potent ingredients into the cells of the skin. The core component of the brand is the ‘EnerCell’ developed by the company’s in-house technology. The ‘EnerCell’ has dual-capsule structure, of which outer capsule helps the component be absorbed into skin and inner capsule is decomposed in the skin to provide cell with energy. They have also sought the help of designer Federico Restrepo which has done the packaging design for many other cosmetic brands such as Origins, Phytomer, Clarins, Enprani and Decleor. The spokesperson is none other than the beautiful Ko Hyun Jung, a reputable Korean actress which has acted in many hit series such as Dae Mul, Queen Seon Duk. 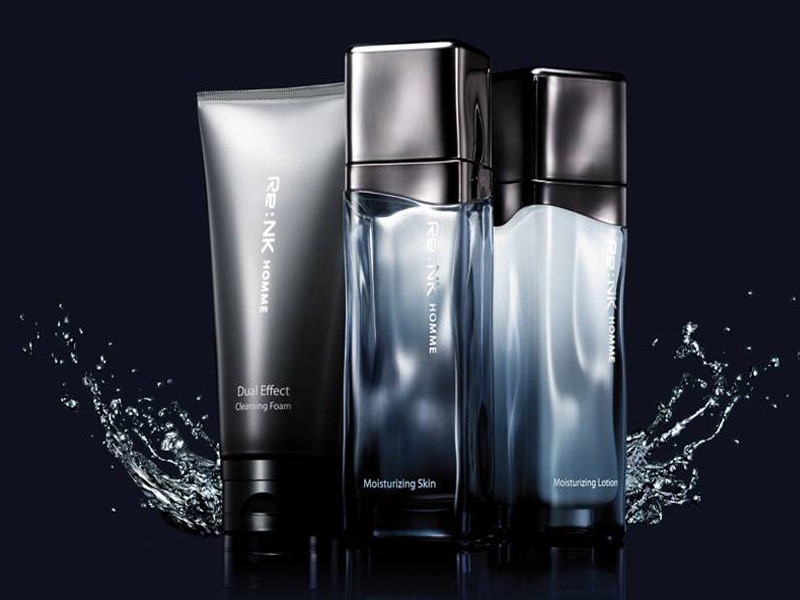 The ‘Re:NK HOMME’ was created by long-time research on cutting-edge life science technology, which helps men tone up their facial feature and vitalize tired skin by providing vital energy. A core component of this product is the ‘EnerCell’ developed by the company’s in-house technology. The ‘EnerCell’ has dual-capsule structure, of which outer capsule helps the component be absorbed into skin and inner capsule is decomposed in the skin to provide cell with energy. The ‘Re:NK HOMME’ line-up consists of three kinds of products ; ‘Moisturizing cream’, ‘Moisturizing lotion’ and ‘Dual effect cleansing foam’. These products have features of aiding to skin rejuvenation, and keeping up resilient skins. Also, they strengthen men’s self defense capability of damaged skins with detox function, suppress sebum with ‘hybrid sebum control system’, and keep up moisture. Meanwhile, a world-class designer ‘Federico Restrepo’, well-known as the ‘Burberry perfume’ and ‘Clarins cosmetics’ designer, participated in the development of these products. Package designs of these products were inspired by the glacier floating in the Arctic Ocean. It was shaped to clean water and refreshing ice with optimized feeling of grip. Launched last month, this whitening line is an upgraded and renewed version of their previous whitening line. Fundamental skin whitening by the ‘EnerWhite TM’, an ingredient developed by independent technology. Introducing the idea from skin whitening of Ko, Hyun-jung, the company’s ad model. These products help users’ skin be shown naturally by the EnerWhite™, a whitening ingredient developed by independent technology, and the EnerCell™ ingredient. The EnerWhite™ is a core ingredient to accentuate the whitening effect by fundamentally preventing the creation of melanin, which was developed after five years of research at the Woongjin Coway Cosmetics Research Center. The inhibition effect of melanin of this ingredient exceeds 200 multiples over arbutin, an existing whitening ingredient. This ingredient also makes it possible to fundamentally whiten users’ skin by inhibiting the movement and maturity of existing melanin. Clinical research institutes have verified that it has excellent skin whitening effect more than two times than existing ingredients. The Cell Luminous Real White Line was developed to maximize whitening effect by three steps of whitening, recycling and moisturizing. Through the first step, the EnerWhite™ prevents the creation of melanin and inhibits their movement fundamentally. It also provides solutions against black, red and yellow spots. After that, the EnerCell™ helps moisturize skin. It is worthy of notice that the idea from skin whitening of Ko, Hyun-jung, the company’s ad model for Re:NK, was applied to this product. She has actively participated in the product development meeting and shared her ideas and know-how about skin whitening. In particular, the idea stemmed from the question why the whitening should be considered with the same criteria even though everyone has different skin colors. She has unique concept about skin whitening method that it should help users find their own brightest skin light by filling lights under the skin, which was applied to this product. This is a wrinkle line which features their key ingredient Bio Cell Activator which helps ease wrinkles and slowly makes them disappear. Contains real diamond in formulation too! This line activates the skin’s natural repair system to help strength the skin. This line uses a fermentation process. Transform tired, dull skin into healthy, clear skin. Consist of three products – serum, cream and mask. Contains natural derived peptides that helps lifts and provides resilience to your skin. This is a line that helps moisturize the dry skin. This is a basic moisture line. It features two types of toner and emulsion. One for normal to dry skin, and the other for oily combination.